Avast! is one of the antivirus titles that has definitely grown in popularity in the past few years due to the continuous improvements the software has gone through with each release. The newest version of Avast has also undergone a lot of upgrades and updates offering great virus and spyware protection, a neat user interface and much more. The newest version of Avast has a clean installation process that doesn’t come bundled with adware toolbars or any other oddities. Although it can take a bit longer than expected, the installation process is simple and trouble-free and it even gives the user the possibility to create a system restore point as a safety precaution. 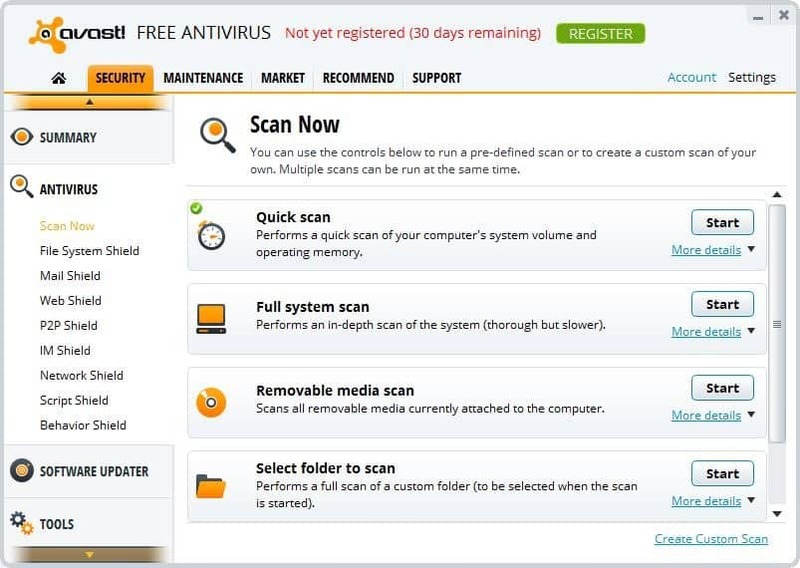 Avast comes with the option of installing a Vista/Windows 7 gadget that can be unchecked in the custom install menu, or it can simply be removed later on after Avast has finished installing on your computer. Avast comes in three versions, one of which is the freeware version that requires only a free registration in order to be able to use it after the 30 day trial period -with some limitations obviously- and for better protection, there is also the Pro and the Premier paid versions. The Avast user interface has not really changed since the previous edition, however that is not something to complain about. After all, why change something that works? The user interface delivers a very neat orange, white and gray look and gives the feeling of a quality product. Every option and feature that can be found on Avast is conveniently placed at the user’s interface for ease of use. On the left side of the screen can be found a handful of tabs that are used to easily navigate around all the features that Avast has to offer, such as Scanning and Real-Time Shields. Once clicked, each of these tabs will reveal sub-categories that will further let you choose between the features offered by Avast in more depth. Obviously, there are quite a few alternatives to Avast and those that stand out most are Microsoft Security Essentials and Avira AntiVir Personal. Microsoft Security Essentials is a real-time protection virus and spyware program that offers a clean and easy to use interface but lacks some of the features that one can find in Avast. It also seems that it focuses more on the Windows platform, being available exclusively for Windows and also requiring a genuine copy of Windows in order to complete the installation successfully. Avira AntiVir is another alternative to Avast, that offers protection against viruses, spyware, Trojans and a whole bunch of other threats. It doesn’t deliver the same quality user interface as the latest version of Avast but it’s not a bad-looking user interface either. Avira is also available on both Windows and Linux operating systems. Avast! has definitely improved since the previous version and it certainly didn’t let down the 160 million registered users. 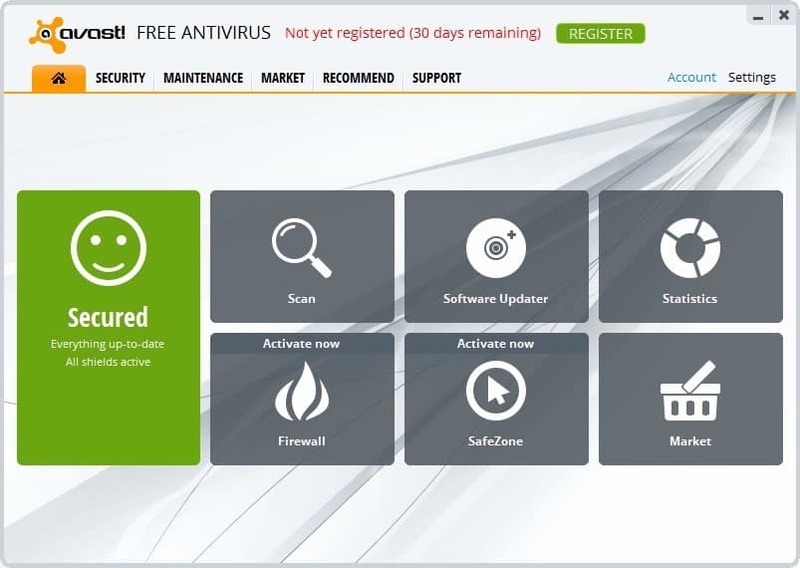 The latest version of Avast offers a clean installation process, a great looking and user friendly interface, lots of features and the possibility to use the home edition for as long as you want if you decide to register your product for free. The paid versions are definitely worth the money, offering a ton of other features that you might not get from other antivirus software. Probably one of the best security solutions out there, Avast has not failed in many of our tests and we're sure that it will just become better and better.